CPUBalance is real-time optimization software containing ProBalance, Bitsum’s proven and real-world demonstrable technology to retain system responsiveness during high loads, or even save you from a hard reset during a worst-case scenario. Learn more about ProBalance here. ProBalance is also available in Process Lasso. The ProBalance algorithm can be actively demo’d in synthetic and real-world tests. Even in Windows 10 and high core count PCs, we continue to be amazed in new real-world scenarios we encounter. CPUBalance is the most distilled version of this algorithm. Even if you have the perfectly tuned PC, our ProBalance algorithm will save you from a worst-case scenario. CPUBalance takes our famous, time-tested (since 2002!) and exclusive ProBalance algorithm that is proven to retain system responsiveness during high CPU loads. It can’t fix all responsiveness problems, but its impact on a high CPU load, even on modern multi-core CPU’s, is amazing. Real-world demos like saving a file in multimedia editing software is a great example; your PC is brought to a sluggish state until you switch away from that app (letting ProBalance kick in since it excludes the foreground app by default), then you see a night and day difference. It’s hard to believe, so test it yourself. You can create your own ‘high load’ demo, and it does not need to run at anything but a normal priority class with normal priority threads. That is all it takes to severely impact the responsiveness of Windows, to the point of it being unusable, and hence the problem that ProBalance resolves. How many other PC optimization algorithms can be DEMO’d in both synthetic and real-world tests? ZERO. We can do that! You can run the live demo yourself, or try real-world instructions which just require a particular type of PC use. 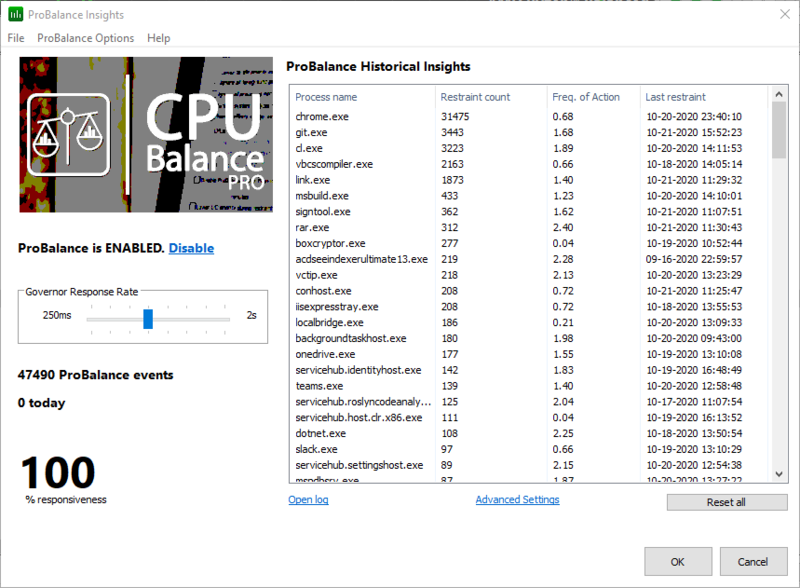 Let ProBalance be there the next time a process goes out of control, or needs a lot of CPU for a period of time! While CPUBalance can stand apart from Process Lasso, it can also run along-side it with perfect integration (when complete). It uses the same core engine (Bitsum’s processgovernor.exe), so you get the same algorithm with either product, and the two do not conflict with one another. 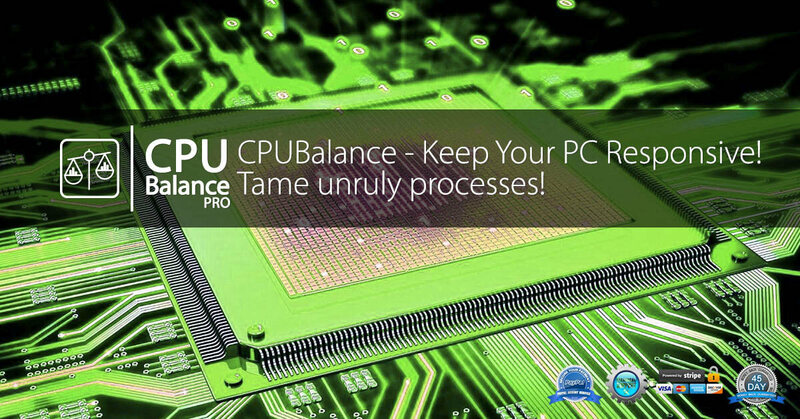 Instead, CPUBalance offers an additional system tray icon and easier access to ProBalance controls. In the future, it will offer more UI functions that may not be present in Process Lasso. However, Process Lasso is always the ‘big dog’ and the ‘up-sell’ that includes everything, all our many algorithms. You can install both products, but it is recommended to choose one or the other. If you need the extended features of Process Lasso, then use it since it also contains all that CPUBalance offers. 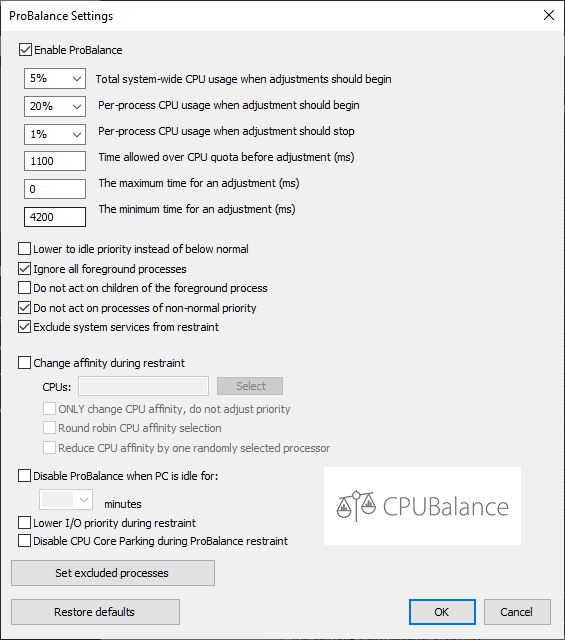 If you are already using Process Lasso, there is no need for CPUBalance. The ProBalance algorithm is a time-tested, proven, demonstrable algorithm to improve Windows PC responsiveness during high CPU loads. It works amazingly well, so the point that it is easy for us to demo in real-world and synthetic tests. To learn more about it, visit this page about ProBalance. v1.0.0.14 – Fix rare issue with co-install of Lasso could cause two instances of CPUBalance governor in some sessions to be running. v1.0.0.10 – Additions to log item types shown by Process Lasso v9 branch logviewer, as present in CPUBalance. Difference between Pro and Free? At present, nothing except your name. That’s right, it is 100% free right now. That may change going forward with certain feature restrictions or such. For this first release, we just wanted to show off our technology. That said, now is the time to buy if you want the best deal, or want to support the project, and we very much appreciate that! IF we ever restrict features, it will be like Process Lasso, only those on the fringes. See table above for planned restrictions in future versions (as you see, only advanced features most don’t use). 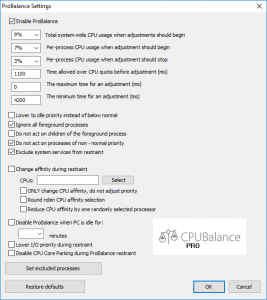 Q: Does CPUBalance replace Process Lasso? A: NO! Nowhere close. It can complement Process Lasso by running along-side it, where it integrates perfectly, or it can run without Process Lasso. I think that it’s actually best to run with Lasso, and that will definitely be true of existing Lasso users who appreciate it’s wide array of features. Q: What happens when Process Lasso and CPUBalance are both installed? A: When installed with Process Lasso, it and CPUBalance work together. They both use the same core engine, ‘processgovernor.exe’. So if you already have Process Lasso, this just extends the user interface and system tray icon, perhaps a newer core engine, and additional ProBalance tweaking. Q: Is ProBalance still going to be part of Process Lasso? A: YES, of course. No tricks here. Both these products will use the latest rendition of Jeremy Collake’s famous ProBalance algorithm. Q: What is the current status? A: Fully functional working beta /w updater. Final v1.0 release imminent. Q: Is a PAD file available?